This is a particularly good article that was sent by a past client of our Firm. 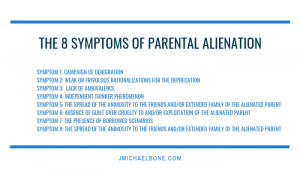 I am fortunate that many of my current and past clients stay engaged with the literature and groups that deal with Parental Alienation, to the point that they wish to share the benefits and knowledge of what they may have acquired as we worked on their case, and the client witnessed for themselves the identification of these alienation scenarios and the strategies that I have developed (with the benefit of the insights of many great clinicians, authors and PA experts through the years). This article is quite good and focuses on an important issue for today: Why We Persevere and Stay on Course for the Child Victims of Parental Alienation. These children are being harmed by the PA. Most love their targeted parent, but have been coerced and brainwashed to reject the loving parent. This sentence, from Dr. Stines’ essay, captures the point: It is much easier to reject someone you know will never leave, than it is to reject someone you can barely hold on to. Strategy, Perseverance, Patience. Three of my many keys to managing these cases. Many years ago, I helped a bit with Bill Eddy’s first book, a landmark publication called Splitting that discussed and defined for the first time what it can be like to go through a divorce with a High Conflict Personality, such as a person with BPD or NPD traits. Here is a video from one of Bill’s series, discussing the analogy between splitting in politics, and the splitting that can occur in divorce. Splittign behaviors can lead to conflict distortions, false allegations, and parental alienation, in a divorce and child custody case. It is always good to understand these phenomena, and to appreciate ways to manage them successfully in a divorce case. 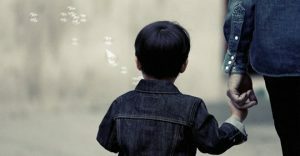 Illinois Divorce: Parental Alienation: What Can a Parent Do? I came across this podcast that features Megan Hunter, and offers some useful information about Personality Disorders and Divorce. A significant of my practice involves divorces and child custody issues that feature traits of personality disorders that affect the custody and wellbeing of children. Megan distinguishes between a situational aspect of divorce, where parents under high stress exhibit negative behaviors, and that of divorces that involve Personality Divorces, False Allegations, and potentially toxic levels of Parental Alienation. Megan is an executive with my colleague Bill Eddy’s High Conflict Institute. Bill Eddy is the author of Splitting and I was privileged to work with Bill and Randi Kreger on the 1st Edition of Splitting, having offered the name of the book to Bill (it was a natural thought…splitting indicating a synonym for a divorce, and the psychological phenomenon that some PDs have), providing some limited content, and writing the foreword for the 1st Edition. Megan Hunter is the CEO of Unhooked Media – a company focused on relationship and conflict resolution through print, digital, and the spoken word. She is the co-founder of the High Conflict Institute and currently serves on the Advisory Board of the Personality Disorder Awareness Network.